On the rooftops of New York City, the Turtles are finishing up their training and preparing to go home. Overlooking the city, they discuss the sudden upsurge in violent activity beyond what the Big Apple’s used to. A foreboding feeling washes over them. Suddenly, a mysterious, masked stranger leaps down between them and begins laying into them all. The masked stranger won’t identify himself, but easily counters all of the TMNT’s moves, shattering Don’s bo staff in the skirmish. He tells them that the old rat in the church has taught them poorly and vanishes with a smoke bomb. The Turtles, fearing he knows too much, give chase. They find the masked stranger a short distance away, sitting peacefully on a rooftop. Leo warns them that it’s a trap, but Raph rushes in, anyway. Using savate and parkour styles, he trounces the Turtles yet again and escapes into the sewers. Presuming home turf advantage, the Turtles expect to make short work of the masked stranger in the sewers. They’re wrong, though, as the enemy sneaks up on them and, using the wing chun style, catches them all off guard and deftly counters their moves. Raph accuses him of being in league with the Foot Clan, but the masked stranger denies affiliation with either the Foot or the Savate. He then says that by besting the students, he’s earned the right to face their master in his dojo and races off to the church lair. The Turtles find the masked stranger awaiting them in the graveyard by the church. The stranger throws them each a bo staff and promises to fight them with nothing but his own staff. Leo attempts to use his swords in the battle, but the stranger breaks them. He then proceeds to disarm and take down each Turtle. The stranger breaks into the church, but the Turtles won’t stay down and follow him. They try cornering him, but the stranger just smacks them aside AGAIN. Don, having had enough of being humiliated, faces the masked stranger one-on-one in a bo staff duel. Don explains that the staff the stranger broke was a gift from his father and master. He then disarms the stranger. The other Turtles rally and the stranger calls it quits. He then takes off his mask, revealing… Master Splinter. Splinter congratulates his sons on their performance and apologizes for the deception. He explains that there is something happening in the city and it is leading to big trouble on the horizon. Splinter tells them that they must all be ready for the unexpected if they are to survive what is to come. 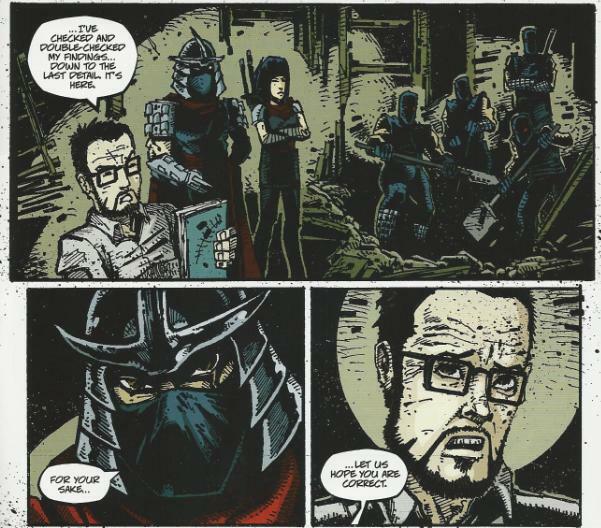 In Japan, Dr. Miller leads the Shredder, Karai and a unit of Foot Soldiers to an old, secluded mansion. He promises Shredder that his research has proven conclusively that “it” is in this location. The Foot Soldiers dig beneath the house and eventually find a casket. They open it to find the body of Kitsune, perfectly preserved in ooze. *This story is continued from TMNT (IDW) #20. The story continues in TMNT (IDW) #22. 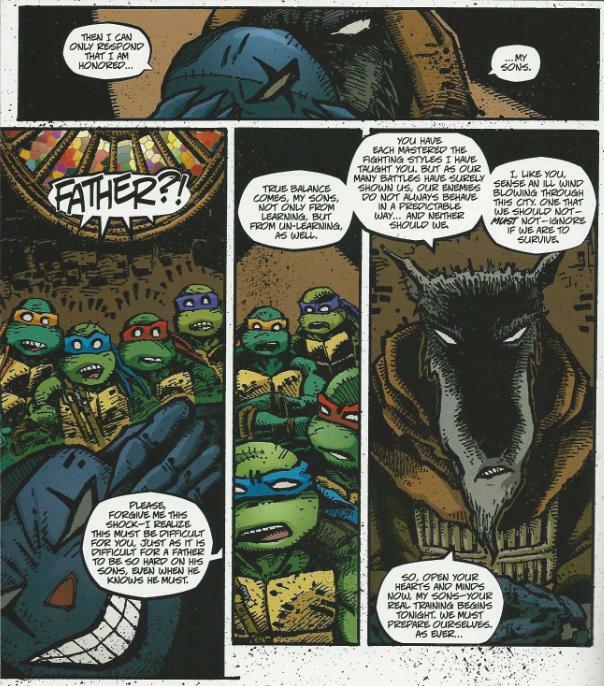 *The Turtles last met the Savate Ninja in TMNT Annual 2012. *Dr. Miller joined the Foot Clan and was tasked with locating Kitsune’s resting place in TMNT: The Secret History of the Foot Clan#4. *This issue was originally published with 6 variant covers: Regular Cover by Eastman and Pattison, Rover RI by Dean Haspiel and Allen Passalaqua, Subscription Variant by Eastman and Pattison, Cover RE Jetpack Exclusive by Eastman, Cover RE Dynamic Forces Exclusive by Eastman and Pattison, Cover RE Ottawa ComiCon Exclusive by Andy Kuhn and Daniel “PeZ” Lopez. With the “Krang War” behind us, we move into IDW’s next big arc: “City Fall”. The name itself summons memories and feelings attached to the celebrated Mirage “City at War” arc, which might set it up for undo comparison. “City at War” was, after all, one of the crowning achievements of the original Mirage run. But let’s try to be fair and not succumb to our baser instincts that demand we compare the two arcs. It won’t be easy, but we can do it if we try. This arc seems to have been foreshadowed as far back as TMNT (IDW) #6, when the dying Savate ninja warned of a war looming on the horizon that will engulf the whole city. We’ve had ample time for the aggressions needed to incite that war to percolate and I look forward to learning just which spark sets off the “City Fall” powder keg. 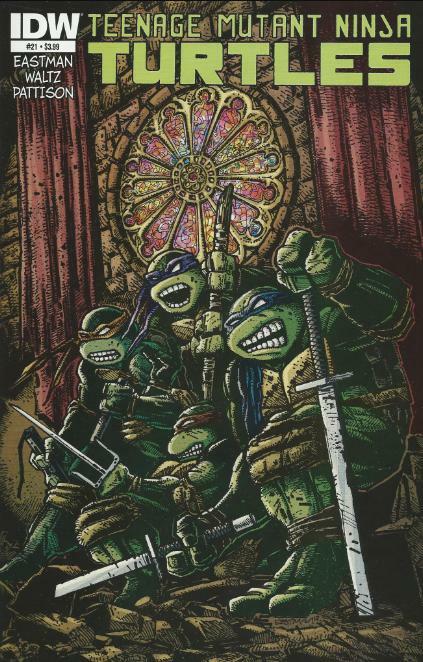 Was it the hierarchy shakeup within the Savate organization that occurred in TMNT Annual 2012? Was it the brazen operations conducted by the Foot in Secret History of the Foot Clan? Was it the Purple Dragons stepping away from crime and toward community watch in TMNT (IDW) #11? Was it all these things combined? We’ll have to wait and see. But the point is that the escalating crime and violence in New York City isn’t some sudden plot point fabricated at the beginning of this issue to facilitate the “City Fall” arc. As you can see, all these aspects of the New York City underworld present in the IDW comic from the start have been leading somewhere (presumably here). The Turtles are only just now starting to notice that things are really beginning to take a turn for the worse. The way the Turtles stare out over the city and comment on the intangible sensation of dread was just a little too trite, but to Waltz’s credit he fought off any urges to include cliché lines like, “There’s a war down there”. So hey, good on him. I suppose my problem with the issue is that it’s rather repetitive. The masked stranger beats the Turtles up, mocks them, runs away and then we wash and repeat three more times. The suspense comes from the “mystery” behind the masked stranger, but one glance at his familiar mutant posture should spell out his identity right from the start. Waltz and Eastman attempt to maintain the secret by having the stranger speak in a way incongruent with how Splinter talks (making lots of puns, dropping oneliners and pulling pranks), but rather than make the reveal seem less obvious, it instead feels really awkward. Does this mean that Splinter can talk like a cackling, pun-spewing douche whenever he feels like it, but only puts on the guise of a mild, reserved sensei for appearances? Or is “theater acting” a ninja skill that Splinter also mastered back in the day? This is the first full issue of Kevin Eastman’s IDW work to be colored and Pattison proves to be a great complement. 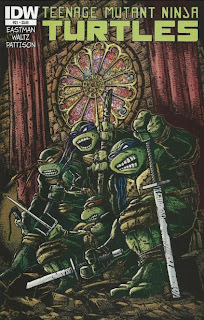 Eastman’s pencils and inks are “classic” and having a modern colorist attached runs the risk of completely altering the atmosphere of his work (the modern colorizations of “Fun with Guns” and Raphael (microseries) #1 seen in TMNT 25th are especially guilty of this). Pattison, though, provides colors that are perfectly fitting and don’t try to overshadow Eastman’s lines. For another example of the opposite, look at Cam Kennedy’s older Star Wars work, such as “Dark Empire” or “Boba Fett: Death, Lies and Treachery”. Then look at his modern work in “Boba Fett: Sacrifice” and “Boba Fett: Agent of Doom”. So much of the look and feel we associate with Cam Kennedy’s Star Wars comics is inextricably tied to that older style of coloring. Modern coloring techniques with all their heavy photoshop filters and effects just completely change that atmosphere and quality to the point where you might not even recognize the latter works as Kennedy’s. So once again, I can’t say enough good things about Pattison’s more laid back approach to coloring seen in IDW’s TMNT book. It complements the pencils rather than try to drown them in a sea of lens flares and smear techniques. Overall, I found this one to be a bit of a dull read. It hinges on a major reveal that’s plainly telegraphed from the start. What’s left is an issue-long fight sequence that quite frankly grows tiresome as it cycles through the same shtick four or five times. Kevin Eastman’s art is always a pleasure, Pattison makes it look great in color and there’s certainly a sense of build-up for the big “City Fall” arc, but the storytelling execution in this one just left me a bit underwhelmed. Speaking of "shtick," there sure was a lot of focus on sticks, staffs, and such in this issue! I likewise appreciate the vivid but simplistic coloring job over Eastman's inks. The panels really do jump right off the page. It would be nice if you could review this on the blog ASAP. Wow. What a disappointment. This comic sucked just like the Hero Comics and the Annual one. Those three aren't even worth re-reading. 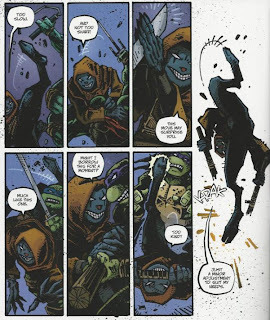 The thing that bugged me about this issue, compared to issues in the past, is that you really don't get a break from the Turtles' battled with the "assassin." It would've been interesting if scenes with the Foot clan searching for Kitsune, or maybe seeing what April and Casey are up to (though they might retread the whole "things are feeling intense around here lately," I dunno). I kinda had the "assassin" figured out when I read the preview pages and had recalled something Eastman had mentioned in a fairly recent interview about the Turtles needing to continue their training (the obvious color scheme and the fact that who else would put the Turtles to the test like that BUT Splinter pretty much seal it. It's certainly not a bad issue, but it is pretty "meh." I am looking forward to the upcoming "City Fall," though. One of the things that stroke me the most of this issue was Eastman's art. Even if the script is average or even awful, i enjoy seen his art style in a turtles book. And speaking of script, there is something about Kitsune that has been bother me since her true nature was revealed. If she is immortal, why did she needed to go through the same ressurection process as Saki? was to keep the apperances? or was the whole immortal ghost witch thingy something that was added later?